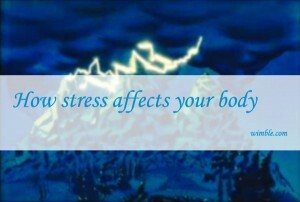 Here is a great video on the physical way stress affects your body and how it makes you ill. Try to avoid situations which create unnecessary stress eg avoid interacting with “friends” who stress you out. For on-going stress eg work, try to take time out through the day. Manage stress weekly (preferably daily) by practising tai chi, yoga or meditation. Do some kind of fun activity such as a sport to give yourself an outlet for the adrenaline. Use a therapy such as Emotional Freedom Techniques to change your approach to stressful situations.